ScrapbooksPlus DT: Cuddling up with COCOA! 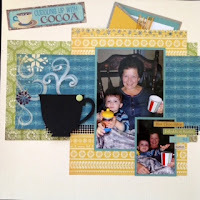 There is nothing better than cuddling up with your grandchild and a mug of Hot Cocoa on a cold winter day! One of my favorite things about the BoBunny Snow Days line of papers is it's versatility! I wanted this page to be bright and cheery to help reflect on the mood that this moment created. I used an off-white card stock with the bright blue, green and yellow in this collection. I love how different it looks! Using my Cricut, I cut out a black cup and vellum steam. To make the steam look more dimensional, I use two layers of vellum and popped one piece up on the other using foam tape. By adding Distressed Stickles, it made the steam curl and separate leaving it with a more realistic look! 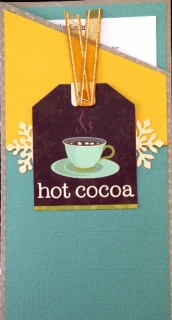 I also wanted to include the recipe I used to make the coca, so I created a pocket and handmade recipe card using the collection and die cuts! I had an absolute blast with this page!! What are you making with the BoBunny Snow Days collection! ?